In this post I thought it might interest those who read my blog to illustrate my approach to capturing a well known landmark and how I come to make a few images which become my take on a much photographed location. 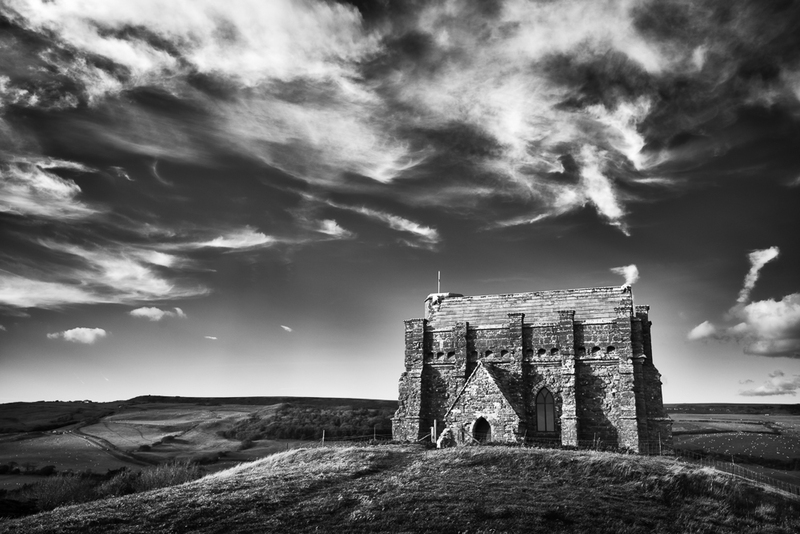 One such famous landmark is St Catherine’s Chapel on the outskirts of Abbotsbury in Dorset. Perched high on a hill overlooking the Jurassic coastline it is very visible from the surrounding hills. The colour image is arguably the ‘straight’ picture postcard shot. A perfectly pleasing image, technically sound, but nothing out of the ordinary. 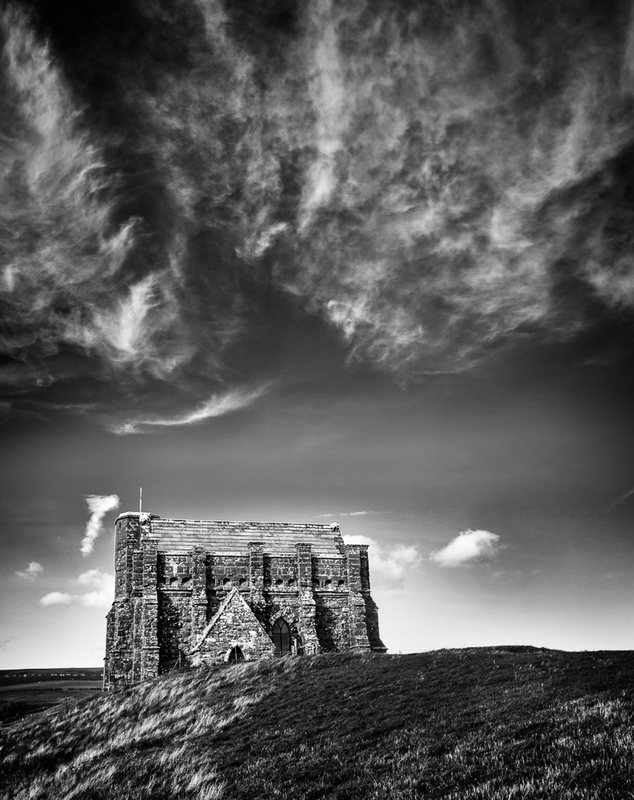 Convert the same image into black and white, and after a little processing in Lightroom and Silver Efex (my go to software for mono work) and the Chapel instantly has a more dramatic appearance. In my opinion still nothing special, but the sky is more a feature of the shot. The third shot and a very different composition, this time a portrait. The wispy clouds above the chapel are all important but somehow I still don’t think it is the best shot in this sequence. Finally, I moved in much closer to the chapel using a wide angle lens. As a consequence the building now dominates the frame and the converging lines of the buttresses give a sense of height and mass. This is complemented by the clouds which are a wonderful backdrop to the harsh lines and solid golden buff limestone structure of the chapel itself. The surrounding landscape has been excluded, so this image no longer provides a sense of place, but as a photograph it’s my favourite of the four. Would it be your choice as well? Certainly the most dramatic, and no longer the picture postcard view which I am always keen to avoid if at all possible. 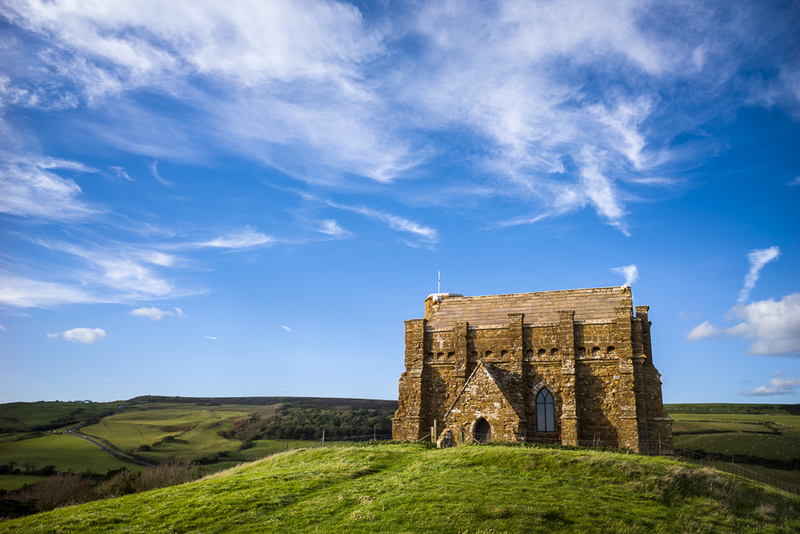 The chapel is thought to have been built in the late 14th Century by the monks of nearby Abbotsbury Abbey. 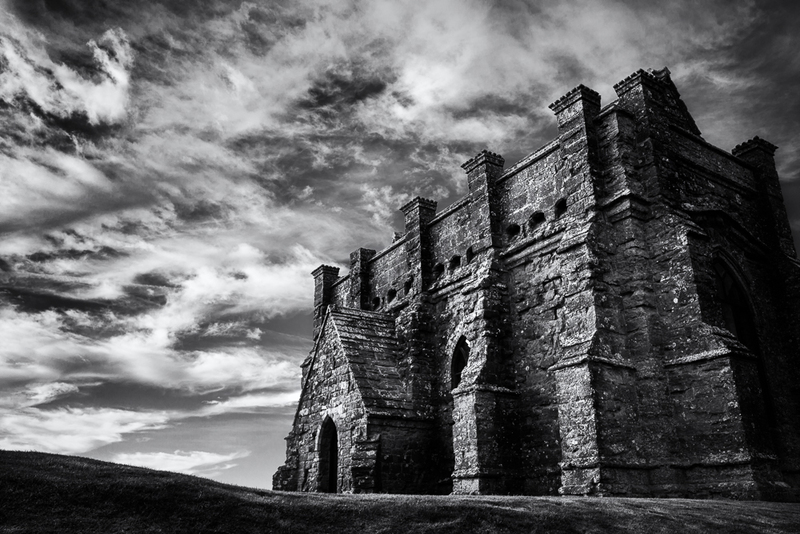 It was used as a place of pilgrimage; its isolated setting allowing monks to withdraw from the monastery during Lent for private prayer and meditation. As it can be seen from the sea it would also have served as a beacon after the Dissolution. You can almost feel the rough texture of the stone and wind blowing the clouds. The fourth is definitely the best – there is drama, atmosphere and something a little sinister about that image. A classic example of how B&W and the right processing (Silver Efex is a superb plug-in) can create such a powerful image.